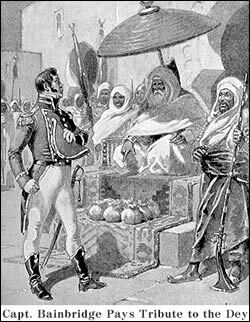 The First Barbary War (1801–1805), also known as the Tripolitan War or the Barbary Coast War, was the first of two wars fought between the United States and the Northwest African Berber Muslim states known collectively as the Barbary States. These were Tripoli and Algiers, which were quasi-independent entities nominally belonging to the Ottoman Empire, and the independent Sultanate of Morocco. Barbary corsairs and crews from the North African Ottoman provinces of Algiers, Tunis, Tripoli and the independent Sultanate of Morocco under the Alaouite Dynasty (the Barbary Coast) were the scourge of the Mediterranean. Capturing merchant ships and enslaving or ransoming their crews provided the Muslim rulers of these nations with wealth and naval power. The Roman Catholic Trinitarian Order or Order of "Mathurins" had operated from France for centuries with the special mission of collecting and disbursing funds for the relief and ransom of prisoners of Mediterranean pirates. According to Robert Davis, between 1 million and 1.25 million Europeans were captured by Barbary pirates and sold as slaves between the 16th and 19th centuries. Barbary corsairs led attacks upon American merchant shipping in an attempt to extort ransom for the lives of captured sailors, and ultimately tribute from the United States to avoid further attacks, much like their standard operating procedure with the various European states. Before the Treaty of Paris, which formalized United States’s independence from Great Britain, U.S. shipping was protected by France during the Revolutionary years under the Treaty of Alliance (1778–83). Although the treaty does not mention the Barbary States in name, it refers to common enemies between both the U.S. and France, which would include the Barbary States or pirates in general. As such, piracy against U.S. shipping only began to occur after the end of the American Revolution, when the U.S. government lost its protection under the Treaty of Alliance. This lapse of protection by a European power led to the first American merchant shipping seized after the Treaty of Paris. On October 11, 1784, Moroccan pirates seized the brigantine Betsey. The Spanish government negotiated the freedom of the captured ship and crew; however, Spain offered advice to the United States on how to deal with the Barbary States. The advice was to offer tribute to prevent further attacks against merchant ships. The U.S. Minister to France, Thomas Jefferson, decided to send envoys to Morocco and Algeria to try to purchase treaties and the freedoms of the captured sailors held by Algeria. Morocco was the first Barbary Coast state to sign a treaty with the U.S. on June 23, 1786. This treaty formally ended all Moroccan piracy against American shipping interests. Specifically, Article 6 of the treaty states that if any Americans captured by Moroccans or other Barbary Coast states docked at a Moroccan city, they would be set free and come under the protection of the Moroccan state. American diplomatic action with Algeria, the other major Barbary Coast state, was much less successful than with Morocco. Algeria began piracy against the U.S. on July 25, 1785 with the capture of the schooner Maria and the Dauphin a week later. All four Barbary Coast states demanded $660,000 each. However, the envoys were given only an allocated budget of $40,000 to achieve peace. Diplomatic talks to reach a reasonable sum for tribute or for the ransom of the captured sailors struggled to make any headway. The crews of the Maria and Dauphin remained in captivity for over a decade, and soon were joined by crews of other ships captured by the Barbary States. In 1795, Algeria came to an agreement that resulted in the release of 115 American sailors they held, at a cost of over $1 million. This amount totaled about 1⁄6 of the entire U.S. budget, and was demanded as tribute by the Barbary States to prevent further piracy. The continuing demand for tribute ultimately led to the formation of the United States Department of the Navy, founded in 1798 to prevent further attacks upon American shipping and to end the extremely large demands for tribute from the Barbary States. Various letters and testimonies by captured sailors described their captivity as a form of slavery, even though Barbary Coast imprisonment was different from that practiced by the U.S. and European powers of the time. Barbary Coast prisoners were able to obtain wealth and property, along with achieving status beyond that of a slave. One such example was James Leander Cathcart, who rose to the highest position a Christian slave could achieve in Algeria, becoming an adviser to the Algerian Bey, or king. Even so, most captives were pressed into hard labor in the service of the Barbary pirates, and struggled under extremely poor conditions that exposed them to vermin and disease. As word of their treatment reached to the U.S., through freed captives' narratives or letters, Americans pushed for direct government action to stop the piracy against U.S. ships. Jefferson reported the conversation to Secretary of Foreign Affairs John Jay, who submitted the Ambassador's comments and offer to Congress. Jefferson argued that paying tribute would encourage more attacks. Although John Adams agreed with Jefferson, he believed that circumstances forced the U.S. to pay tribute until an adequate navy could be built. The U.S. had just fought an exhausting war, which put the nation deep in debt. Federalist and Anti-Federalist forces argued over the needs of the country and the burden of taxation. Jefferson's own Democratic-Republicans and anti-navalists believed that the future of the country lay in westward expansion, with Atlantic trade threatening to siphon money and energy away from the new nation on useless wars in the Old World. The U.S. paid Algiers the ransom, and continued to pay up to $1 million per year over the next 15 years for the safe passage of American ships or the return of American hostages. A $1 million payment in ransom and tribute to the privateering states would have amounted to approximately ten percent of the U.S. government's annual revenues in 1800. "Immediately prior to Jefferson's inauguration in 1801, Congress passed naval legislation that, among other things, provided for six frigates that 'shall be officered and manned as the President of the United States may direct.' … In the event of a declaration of war on the United States by the Barbary powers, these ships were to 'protect our commerce & chastise their insolence — by sinking, burning or destroying their ships & Vessels wherever you shall find them.'" On Jefferson's inauguration as president in 1801, Yusuf Karamanli, the Pasha (or Bashaw) of Tripoli, demanded $225,000 from the new administration. (In 1800, Federal revenues totaled a little over $10 million.) Putting his long-held beliefs into practice, Jefferson refused the demand. Consequently, on May 10, 1801, the Pasha declared war on the U.S., not through any formal written documents but in the customary Barbary manner of cutting down the flagstaff in front of the U.S. Consulate. Algiers and Tunis did not follow their ally in Tripoli. In response, "Jefferson sent a small force to the area to protect American ships and citizens against potential aggression, but insisted that he was 'unauthorized by the Constitution, without the sanction of Congress, to go beyond the line of defense.'" He told Congress: "I communicate [to you] all material information on this subject, that in the exercise of this important function confided by the Constitution to the Legislature exclusively their judgment may form itself on a knowledge and consideration of every circumstance of weight." Although Congress never voted on a formal declaration of war, they did authorize the President to instruct the commanders of armed American vessels to seize all vessels and goods of the Pasha of Tripoli "and also to cause to be done all such other acts of precaution or hostility as the state of war will justify." The American squadron joined a Swedish flotilla under Rudolf Cederström in blockading Tripoli, the Swedes having been at war with the Tripolitans since 1800. On May 31, 1801 Commodore Edward Preble traveled to Messina, Sicily to the court of King Francis of the Kingdom of the Two Sicilies. He sought help and found a good ally. The Kingdom was at war with Napoleon, but Francis supplied the Americans with manpower, craftsmen, supplies, gunboats, mortar boats, and the ports of Messina, Syracuse and Palermo to be used as a naval base to launch operations against Tripoli, a port walled fortress city protected by 150 pieces of heavy artillery manned by 25,000 soldiers, assisted by a fleet of 10 ten gunned brigs, 2 eight gun schooners, 2 large galleys, and 19 gunboats. The schooner USS Enterprise (commanded by Lieutenant Andrew Sterret) defeated the 14-gun Tripolitan corsair Tripoli after a fierce but one-sided battle on August 1, 1801. In 1802, in response to Jefferson's request for authority to deal with the pirates, Congress passed "An act for the Protection of Commerce and seamen of the United States against the Tripolitan cruisers", authorizing the President to "…employ such of the armed vessels of the United States as may be judged requisite… for protecting effectually the commerce and seamen thereof on the Atlantic ocean, the Mediterranean and adjoining seas." "The statute authorized American ships to seize vessels belonging to the Bey of Tripoli, with the captured property distributed to those who brought the vessels into port." The U.S Navy went unchallenged on the sea, but still the question remained undecided. Jefferson pressed the issue the following year, with an increase in military force and deployment of many of the Navy's best ships to the region throughout 1802. The USS Argus, Chesapeake, Constellation, Constitution, Enterprise, Intrepid, Philadelphia and Syren all saw service during the war under the overall command of Commodore Edward Preble. Throughout 1803, Preble set up and maintained a blockade of the Barbary ports and executed a campaign of raids and attacks against the cities' fleets. In October 1803, Tripoli's fleet was able to capture USS Philadelphia intact after the frigate ran aground while patrolling Tripoli harbor. Efforts by the Americans to float the ship while under fire from shore batteries and Tripolitan naval units failed. The ship, its captain, William Bainbridge, and all officers and crew were taken ashore and held as hostages. Philadelphia was turned against the Americans and anchored in the harbor as a gun battery. "The most bold and daring act of the age." On the night of February 16, 1804, Lieutenant Stephen Decatur led a small detachment of U.S. Marines aboard the captured Tripolitan ketch rechristened USS Intrepid, thus deceiving the guards on the Philadelphia to float close enough to board her. Decatur's men stormed the ship and overpowered the Tripolitan sailors. With fire support from the American warships, the Marines set fire to Philadelphia, denying her use by the enemy. British Admiral Horatio Nelson, himself known as a man of action and courage, reportedly called this "the most bold and daring act of the age." 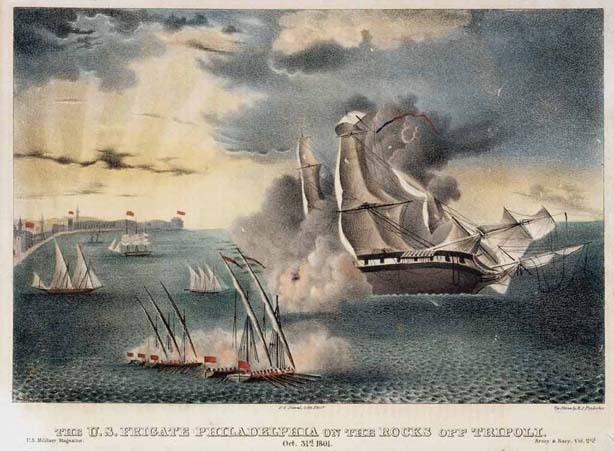 Preble attacked Tripoli on July 14, 1804, in a series of inconclusive battles, including a courageous but unsuccessful attack attempting to use USS Intrepid under Captain Richard Somers as a fire ship, packed with explosives and sent to enter Tripoli harbor, where she would destroy herself and the enemy fleet. However, Intrepid was destroyed, possibly by enemy gunfire, before she achieved her goal, killing Somers and his entire crew. 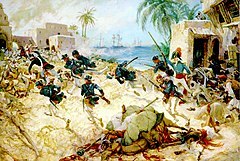 The turning point in the war was the Battle of Derna (April–May 1805). Ex-consul William Eaton, a former Army officer who held the rank of general, and US Marine Corps First Lieutenant Presley O'Bannon led a force of eight U.S. Marines, 500 mercenaries—Greeks from Crete, Arabs, and Berbers — on a march across the desert from Alexandria, Egypt to assault and to capture the Tripolitan city of Derna. This was the first time in history the United States flag was raised in victory on foreign soil. The action is memorialized in a line of the Marines' Hymn—"the shores of Tripoli." 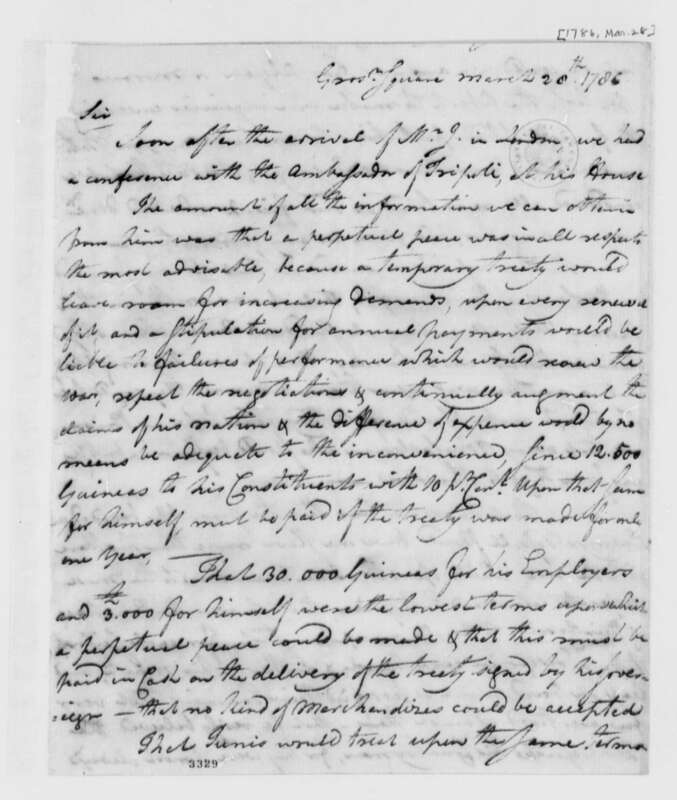 In agreeing to pay a ransom of $60,000 for the American prisoners, the Jefferson administration drew a distinction between paying tribute and paying ransom. At the time, some argued that buying sailors out of slavery was a fair exchange to end the war. William Eaton, however, remained bitter for the rest of his life about the treaty, feeling that his efforts had been squandered by the State Department diplomat Tobias Lear. Eaton and others felt that the capture of Derna should have been used as a bargaining chip to obtain the release of all American prisoners without having to pay ransom. Furthermore, Eaton believed the honor of the United States had been compromised when it abandoned Hamet Karamanli after promising to restore him as leader of Tripoli. Eaton's complaints generally fell on deaf ears, especially as attention turned to the strained international relations which would ultimately lead to the withdrawal of the U.S. Navy from the area in 1807 and to the War of 1812. The First Barbary War was beneficial to the military reputation of the U.S. America's military command and war mechanism, which had been up to that time relatively untested. 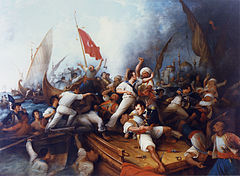 The First Barbary War showed that America could execute a war far from home, and that American forces had the cohesion to fight together as Americans rather than separately as Georgians or New Yorkers. The United States Navy and Marines became a permanent part of the American government and American history, and Decatur returned to the U.S. as its first post-Revolutionary war hero. The Tripoli Monument, the oldest military monument in the U.S., honors the heroes of the First Barbary War: Master Commandant Richard Somers, Lieutenant James Caldwell, James Decatur (brother of Stephen Decatur), Henry Wadsworth, Joseph Israel and John Dorsey. Originally known as the Naval Monument, it was carved of Carrara marble in Italy in 1806 and brought to the U.S. as ballast on board the USS Constitution ("Old Ironsides"). From its original location in the Washington Navy Yard, it was moved to the west terrace of the national Capitol and finally, in 1860, to the U.S. Naval Academy in Annapolis, Maryland. ↑ Wars of the Barbary Pirates. pp. 39. http://books.google.dz/books?id=fQJI5cX-klYC&printsec=frontcover&hl=fr&source=gbs_ge_summary_r&cad=0#v=onepage&q&f=false. Retrieved August 27, 2012. ↑ Rojas, Martha Elena. ""Insults Unpunished" Barbary Captives, American Slaves, and the Negotiation of Liberty." Early American Studies: An Interdisciplinary Journal. 1.2 (2003): 159–86. ↑ Battistini, Robert. "Glimpses of the Other before Orientalism: The Muslim World in Early American Periodicals, 1785–1800." Early American Studies: An Interdisciplinary Journal. 8.2 (2010): 446–74. ↑ Parton, James. "Jefferson, American Minister in France." Atlantic Monthly. 30.180 (1872): 405–24. ↑ Miller, Hunter. United States. Barbary Treaties 1786–1816: Treaty with Morocco June 28 and July 15, 1786. The Avalon Project, Yale Law School. ↑ Blum, Hester. "Pirated Tars, Piratical Texts Barbary Captivity and American Sea Narratives." Early American Studies: An Interdisciplinary Journal. 1.2 (2003): 133–58. ↑ Richard Lee (2011). In God We Still Trust: A 365-Day Devotional. Thomas Nelson Inc. p. 69. ISBN 978-1-4041-8965-2. http://books.google.com/books?id=xgI535e9Xt4C. ↑ Harry Gratwick (19 April 2010). Hidden History of Maine. The History Press. p. 52. ISBN 978-1-59629-815-6. http://books.google.com/books?id=GQX8SYLjKckC. ↑ United States. Dept. of State (1837). The diplomatic correspondence of the United States of America. Printed by Blair & Rives. p. 605. http://books.google.com/books?id=od6PAAAAMAAJ. ↑ Priscilla H. Roberts; Richard S. Roberts (2008). Thomas Barclay (1728-1793): Consul in France, Diplomat in Barbary. Associated University Presse. p. 184. ISBN 978-0-934223-98-0. http://books.google.com/books?id=4PmWSLcoGCoC. ↑ Frederick C. Leiner (2006). The End of Barbary Terror: America's 1815 War Against the Pirates of North Africa. Oxford University Press. pp. 17–18. ISBN 978-0-19-518994-0. http://books.google.com/books?id=sRWhmVTnndoC. ↑ United States Congressional Serial Set, Serial No. 15038, House Documents Nos. 129-137. Government Printing Office. p. 8. GGKEY:TBY2W8Z0L9N. http://books.google.com/books?id=CaPylhG5Ee0C. ↑ "American Peace Commissioners to John Jay," March 28, 1786, "Thomas Jefferson Papers," Series 1. General Correspondence. 1651–1827, Library of Congress. LoC: March 28, 1786 (handwritten). ↑ London 2005, pp. 40,41. ↑ United States Federal State and Local Government Revenue, Fiscal Year 1800, in $ million, usgovernmentrevenue.com. ↑ Miller, Nathan (1997-09-01). The U.S. Navy: a history. Naval Institute Press. p. 46. ISBN 978-1-55750-595-8. http://books.google.com/books?id=aJhgcoxbjLoC&pg=PA46. Retrieved 9 May 2011. ↑ Tucker, 2005, pp. 326 – 331. ↑ Eaton had requested 100 marines, but had been limited to eight by Commodore Barron, who wished to budget his forces differently. Daugherty 2009, pp. 11–12. ↑ "Treaty of Peace and Amity, Signed at Tripoli June 4, 1805". The Avalon project, Yale Law School.. http://avalon.law.yale.edu/19th_century/bar1805t.asp. ↑ Tucker, 2005, p. 464. ↑ Giovanni C Micali. "Tripoli Monument at the U.S. Naval Academy in Annapolis, Maryland". dcmemorials.com. http://www.dcmemorials.com/index_indiv0003204.htm. ↑ Tucker, 2005, p. 332. "Undeclared War". Penn State Press. 2004. ISBN 978-0-271-02607-7. http://books.google.com/books?id=f9kT6Az5HIsC. "Victory in Tripoli: How America's War with the Barbary Pirates Established the U.S. Navy and Shaped a Nation". John Wiley & Sons, Inc.. 2005. ISBN 0-471-44415-4. "To the Shores of Tripoli: The Birth of the U.S. Navy and Marines". Bluejacket Books. 1991. ISBN 1-55750-966-2. "History of the United States of America During the Administrations of Thomas Jefferson". 1986. Boot, Max (2003). The Savage Wars of Peace: Small Wars and the Rise of American Power. New York: Basic Books. ISBN 046500721X. LCCN 2004-695066. Daugherty, Leo J. (2009). The Marine Corps and the State Department: enduring partners in United States foreign policy, 1798-2007. McFarland. ISBN 978-0-7864-3796-2. http://books.google.com/books?id=Ir-hm6IGWnEC. "A Rage for Glory: The Life of Commodore Stephen Decatur, USN". Free Press. 2004. Lambert, Frank (2005). "The Barbary Wars: American Independence in the Atlantic World". New York: Hill and Wang. ISBN 978-0-8090-9533-9. "Power, Faith, and Fantasy: The United States in the Middle East, 1776 to 2006". W.W. Norton & Co. 2007. ISBN 978-0-393-33030-4. "Tripoli: The United States' First War on Terror". Presidio Press. 2006. "Six Frigates: The Epic History of the Founding of the U.S. Navy". W. W. Norton. 2006. ISBN 978-0-393-05847-5. "Jefferson's War: America's First War on Terror, 1801–1805". Carroll & Graf. 2003. "The Pirate Coast: Thomas Jefferson, the First Marines, and the Secret Mission of 1805". Hyperion. 2005. Eric Scigliano. "Our original Libyan misadventure". Salon.com. http://www.salon.com/news/libya/index.html?story=/politics/war_room/2011/04/17/libya_jefferson_scigliano. Joshua E. London. "How America's war with the Barbary Pirates Established the U.S. Navy and Shaped a Nation". victoryintripoli.com. http://www.victoryintripoli.com/.